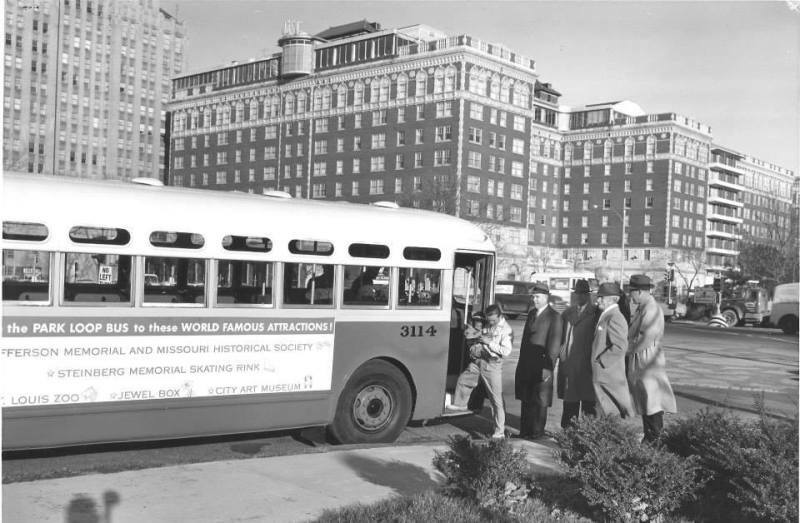 This early-1960s promo shot of Forest Park’s “Park Loop Bus” was taken at Kingshighway and Lindell. The buildings across the street are the Chase Hotel and Park Plaza. One of the upright mammals boarding the bus is Mr. Moke, The World’s Only Talking Chimpanzee, with his trainer Mike Kostial of the St. Louis Zoo. Mr. Moke was the star of a popular St. Louis Zoo show during the early 1960s, where he would make sounds that resembled “Mama”, “no” and “goodbye”. Mr. Moke, who once did the Sullivan Show, also could write “Mama” on a blackboard. When his trainer, Mike Kostial, asked him if he loved Papa, Mr. Moke would say, “No,” and shake his head. Don’t forget to take advantage of the LouFest Trolley Saturday and Sunday to reach the fest in Forest Park. Click here for all of the details. Photo courtesy of Joe Sonderman. The building behind the bus is the Chase Hotel, later the Chase Park Plaza, so this is the corner of Lindell and Kingshighway. Yep, it’s Mister Moke all right, with his trainer, Mike K. The short gentleman closest to the camera in a grey overcoat is zoo director, George P. Vierheller.